July 10 is Nikola Tesla’s birthday. 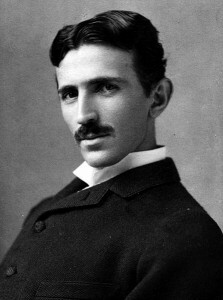 Nikola Tesla was a Serbian-American engineer and inventor. He is best known for his work with electricity and power systems. He is also known for his prolific work ethic, producing patent after patent for improvements on electrical devices and, in his later years, going a little insane. Tesla began his career as an electrician for a Budapest telephone company where he made several enhancements to the telephone systems there. This led him to work for another telephone company in France owned by Thomas Edison. His work there attracted the attention of Edison and Tesla immigrated to the United States to work in Edison’s Machine Works. One project Tesla worked on was the improvement of Edison’s direct current generators. Edison was reported to say a solution to the problems would be worth $50,000. Tesla took him to heart and solved the problems with the generators over the course of four months. When Tesla attempted to collect the money, he was told the offer was a joke and offered a $10/week raise instead. Tesla did not see the joke and resigned. After forming his own electric company, Tesla Electric Light and Manufacturing, he obtained patents for electric arc lighting and electric machine commutators. Another patent he obtained was for an alternating current induction motor that would attract the attention of George Westinghouse. Westinghouse was interested in creating a power network similar to the ones being created in Europe at the time that used alternating current to transmit power across long distances. Tesla’s patents would help him achieve that goal. It probably did not hurt that his previous employer wanted to do the same thing, but with direct current. Eventually, Edison’s direct current network would lose to Westinghouse’s alternating current network, but the resulting battle nearly bankrupted Westinghouse. In order to save the company, Tesla settled for a lump sum for his patent royalties. Tesla would go on to work with the newly discovered x-rays where he designed a device that generated x-rays without a target electrode and powered by a tesla coil. He stopped work along these lines when he felt x-rays were too hazardous to experiment with. He returned to his principal line of work, the wireless transmission of power and information. When Guglielmo Marconi made his famous radio broadcast and inventing radio communication, Tesla was said to claim the feat was done with 17 of his patents. There would be several lawsuits between the two men. Tesla would eventually ‘win’ in the United States years after his death. Tesla’s later years were marked by the common problem of the creative type. His ideas were grand in scope, such as worldwide wireless power distribution, but he lacked the funding or means to implement them. He would gain investors to fund his work, but never produce anything that would keep the funding coming. His last two grand projects in Colorado Springs, Colorado and Wardenclyffe in New York were towering systems of electrical equipment, promising the next big leap in electrical science. Both ran out of money before completion. Tesla was virtually penniless at the time of his death. His days consisted of caring for injured pigeons he found between his trips to the cathedral and library. His rent was paid along with a $125/month stipend by Westinghouse. Tesla would occasionally announce a new invention involving power transmission, methods to locate minerals buried in the Earth and even a beam weapon powerful enough to end war forever. He died alone in his hotel room. The Federal Bureau of Investigations seized his belongings and had a MIT professor sift through them to see if there was anything that could be deemed dangerous to the public. Nothing dangerous was found and his ashes and estate was shipped to Belgrade to be housed in the Nikola Tesla Museum.